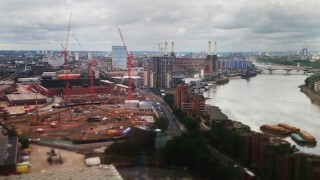 Nine Elms, as viewed from a grubby window in Market Towers. Nine Elms, of course, needs no help in promoting itself. Even before you consider the marketing budgets of the individual developers or the work of the Nine Elms team its central London location and iconic buildings, whether present or future, means my occasional musings can only be on the fringes of relevance. However, one aspect I have been involved in is the employment aspect and this is somewhere the council is playing a big rôle. I’m hugely proud of the work of Wandsworth Work Match who are already getting jobs for local residents in Nine Elms (and elsewhere). If forced to think of highlights from being a councillor then getting the feedback from Work Match after I’ve referred people to them would easily be among them. Much is made of the more than 20,000 jobs that Nine Elms will create when complete. Rightly so. It has to be the chief benefit of the development for local residents. However, when we push that we tend to overlook the construction jobs created while development takes place. The Nine Elms Strategy Board last week had a presentation from Mace who have undertaken skills forecasting work for the board. The idea is to understand what sort of jobs would be required and when, so training providers can adapt their offer accordingly. The sheer scale of Nine Elms means that the skills that will be required do not exist in sufficient numbers in London: we either have to import workers from elsewhere, or train them. The numbers required are huge. Without going into the detail of various skills or phasing there will be over 8,500 people working on construction sites at the peak in 2016 when there will be 25 separate projects. Between 2015 and 2021 the number of workers will never drop below 5,000 jobs, overall there’s anticipated to be at least ten years of construction at Nine Elms. The challenge for the council is ensuring that a fair share (or maybe more than a fair share) of those jobs are taken by Wandsworth residents. If you, or someone you know, think you right for one of them then get in touch with Work Match.